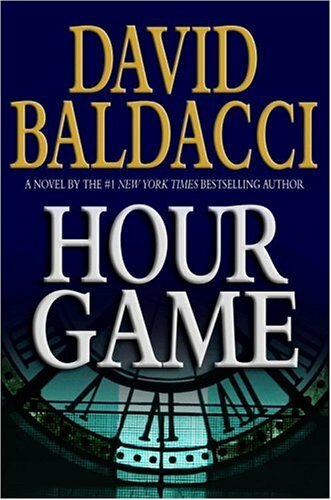 The Hour game is a mystery/suspense novel by David Baldacci. Normally I do not read mystery novels, or even fictional books. For the past few years I have preferred to read only nonfiction, and rarely would a fiction novel engage me, but this author seems to have recaptured my interest in realistic fiction. The book revolves around two private detectives and their pursuit of a mastermind serial killer. This was actually the second of three books of Baldacci’s I’ve read, the other two were good, but The Hour Game was easily my favorite. My dad was the one who recommended that I read these three, and I was surprised because never in my life had I seen him read a mystery. The books were actually given to him by my uncle who is a follower of Baldacci’s novels. The book was about 700 pages long, but it only took me three days to read, which must say something about how much I enjoyed it. I think the way this book was written is the key to why I was so attracted to it. Baldacci has a fairly unique and captivating writing style. He always keeps his reader interested with sudden twists, and never allows one thing to drag, or he doesn’t dwell on one subject longer than necessary. Something is always happening in the novel. Another thing I admired in his writing was that he allowed his reader to create their own conception of what the characters and scene looked like. A lot of times when I read, the author will have these long descriptive paragraphs on what a tree looks like or how someone walks. Baldacci gives a very basic description that allows him to characterize, but still leave room for his reader’s natural assumptions of what someone may look like. The characterization of the people was another thing I thought was very interesting. Certain chapters of the book were seen through the serial killers eyes, where we could learn what he was thinking in doing, but without actually learning his identity. This allowed the author to characterize him without revealing who he was and ruin the mystery. It made it very fascinating when the identity of the killer was revealed, and we found that it was another character that had been involved since nearly the beginning. After that it was actually difficult to think about, because it was like combining the personalities of two people who have suddenly become one. One thing I did not like about the book was the details of the mystery. In each of the three I read the whole story came together near the end, where all the pieces were suddenly coming into place, but it is written so that the reader cannot possibly solve it since certain things are left out. It makes one think that they might have it solved, but an extra fact or person is introduced right before the mystery is solved. Although I didn’t like how that was done, it didn’t make me think anything less of the actual story. I guess doing a recurring thing as a hobby can seem pointless. Not reading, but reviewing. The Hour Game, though a book I enjoyed amply, cannot give rise to an insightful review. Also I'm trying to make it the last book read this year, instead of the penultimate one. The book bears the signature of its author. Only I can't decide if that's beneficial all the way through. Make no mistake, The Hour Game is, by high standards, a paint by numbers book. From the way I see it, it has a great heart. It's a guilty pleasure. Not because of sappy romance, but its cliched style, not because of its willful body count, but because of the innocent prose, not because of its sexual murders (there aren't any here), but because I'm confident that Baldacci tried to write in a different hand and couldn't quite pull it off. The most distinctive trait of this book is that the chapter endings are so lame. I may have missed some double entendre, but I won't bet on it. The book is very pious considering the subject matter. It seems like an old book from the 70's or so. What removes this illusion is the characterization of its main villain. Some of his motives seem nonsensical, but he as a person rings true. Having said that, I luckily did see through the mystery in a flash of lucidity. As for the second murderer, I can take no credit for that as it was very plainly obvious. This was the exceptional book where a cruel murder hasn't taken place in fine Baldacci style. This is why I think the author was experimenting to stay fresh. As a fan, I think he did accomplish much of his intent. A serial killer begins killing people in this quiet Southern town and it appears as though he is copying serial killers' methods from the past. Two former Secret Service agents who now have a private agency are helping solve the case. Once again David Baldacci has written a book I did not want to put down. It is a page turner. I do admit that there are various sub-plots within the book. A a myriad of characters with many interrealtionships. But I loved this. And they are all well written. I am sure this book will be made into a movie. This book brings back Secret Service Agents Sean King and Michelle Maxwell. Only this time they are former agents who have founded their own Private Investigation firm. They are hired to prove the innocence of a man that has been charged with burglarizing the wealthest family in town, the Battles. But rather quickly you will see that this investigation takes a back seat. For our two detectives are brought in as deputies to help solve a quickly growing number of murders by a serial killer. Two disgraced Secret Service Agents team up to investigate a burglary. The plot quickly evolves into a series of copy-cat murders. If you pick this book up, cancel your plans. You won’t put it down until you reach the surprise finish. This was an entertaining book to read, and not as obvious as most murder mysteries. The characters were engaging and the plot kept me guessing to the end. This wasn't an enthralling book, but it is worth reading. Hour Game is the second book in the King and Maxwell series and the first I have read. It started off like a shot and kept the story running from beginning to end. Both King and Maxwell are x-secret service, Maxwell was an Olympian and King is a lawyer and they are in business together as private investigators. King is the brains and Maxwell is the brawn but only in relation to each other and they make a pretty dangerous team to go up against. The story starts out with King and Maxwell near the end of a long dry spell for work. A local handy man is accused of robbery and K & M are hired to find out if he's innocent. Shortly after that several grisly murders are discovered in the area and since it is a relatively small town and Maxwell found the first body the local Sheriff asks them to help in the investigation. What is interesting is the two unrelated cases seem to have more and more in common as time goes by. But at the same time the body count continues to rise, more pressure is put on everyone and the populace of the little town is starting to panic. Who's next on the killer spree? Can K & M catch the killer/s before he/she strikes again? There are too many plots and characters. It's a good book but you need a murder board to keep track. It's a pretty good story and worth the read. Excellent book. Could not put down. He's copying famous serial killers and the game has just begun. A woman is found murdered in the woods. It seems like a simple case but it soon escalates into a terrible nightmare. Someone is replicating the killing styles of the most infamous murderers of all time. No one knows this criminal's motives...or who will die next. Didn't like this one as well as the others in the series. Put it down and had to start it a couple of times. King and Maxwell are tracking a copy cat serial killer who leaves behind a certain type of watch and takes souvenirs. The chemistry between Sean and Michelle was more interesting than plot. You know things are intense when a book starts off with a dead girl being dragged in the woods to be posed. David Baldacci's Hour Game, the second in the King and Maxwell series, starts off like that. In fact, it looks like the killer might be a Zodiac copycat but that theory goes out the window when another body appears using another infamous murderer' M.O. But this is not the case ex-Secret Service Agents Sean King and Michelle Maxwell, who have started a P.I. business together have been hire to investigate. Their case is investigating a burglary at the house of a very prominent Southern family called The Battles. Honestly, King and Maxwell are trying to reinforce if the suspect for the burglary did the actual crime. Now, does this home invasion crime connect with the serial killings going on? Yes! Yes they connect, converge, and overlap into 500 pages of an intense old fashioned murder mystery. The character of Sean King definitely reminded me of Columbo multiple times during this book. Baldacci knows how to captivate and draw me into his narrative. He did it with Split Second and achieved it again with Hour Game. These books are big but so addicting they go by quickly. I knew things were going to get very intricate and complex when I had to draw my own Battle Family map along with acquaintances. Everybody who was introduced was somehow connected with the Battle Family. I enjoyed the setup for this book - a killer imitating famous serial killers. But after a bit, that idea seemed to get left out as a Peyton Place story thread took over. Not as interesting to me, to say the least. Still, I was entertained, so no real complaints! To many characters, plots& subplots that are confusing and muddled to keep track of. Same with the motives. New York : Warner Books, c2004.